The feeling of betrayal is not something that everyone looks forward to, if you have been betrayed at any point in your life, you would know exactly how that feels. It is said that the feeling of betrayal is far worse or more painful than a physical hurt. You can get betrayed by anyone, it could be your dear ones, friends, colleagues or sometimes even the person whom you trust and love the most. How do you deal with someone who has betrayed you? Betrayal never comes knocking on your door, when it comes, it rips you apart. What if you knew that, someone was going to betray you beforehand? Would you still let that person continue to be in your life? Would you let that person betray you? 1. Psalm 41:9 Even my closest friend whom I trusted, the one who ate my bread, has lifted his heel against me. 2. Psalm 55:12-14 For it is not an enemy who insults me— I could have handled that— nor is it someone who hates me and who now arises against me— I could have hidden myself from him— but it is you— a man whom I treated as my equal— my personal confidant, my close friend! We had good fellowship together, and we even walked together in the house of God! 3. Job 19:19 My close friends detest me. Those I loved have turned against me. Unless you feel the pain of betrayal you won’t know what a person who is betrayed is going through. 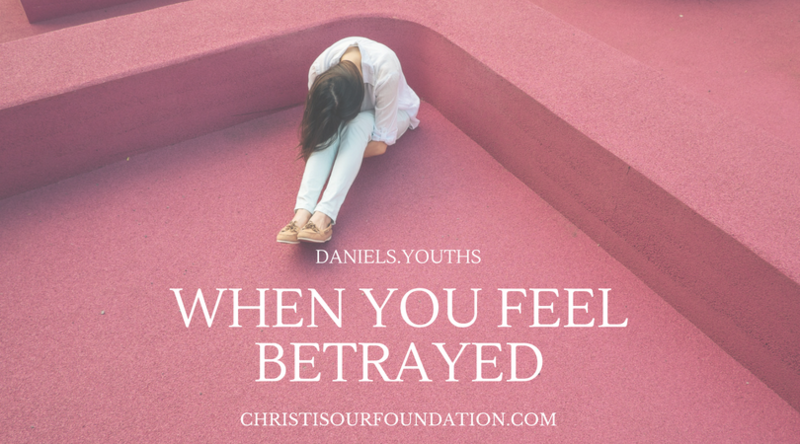 Jesus was betrayed twice so he knows exactly how it feels when someone dear to you betrays you. It’s no revelation that Judas betrayed Jesus to the Pharisees and Peter denied Jesus thrice just as he had predicted about it. In both the cases he knew exactly how, when and who would betray him, yet he chose to forgive and love them unconditionally. Forget the past – We all tend to remain in the pit of pain and we forget to forget the past. Put your hurt, betrayals behind. Isaiah 43: 18-19 “Forget the former things; do not dwell on the past. See, I am doing a new thing! Now it springs up; do you not perceive it? I am making a way in the wilderness and streams in the wasteland. Trust God to bring you out of this pain – Remember that, God is always there by our side to carry us out of this pain, just trust him. Psalm 9:10 Those who know your name trust in you, for you, LORD, have never forsaken those who seek you. God has seen the endless night that you have spent crying in his presence. He has a count of every single tear you have shed. So get up on your feet, put the past behind. He has taken care of your pain. Forgive, forget and trust him, he has something very beautiful in store for you.